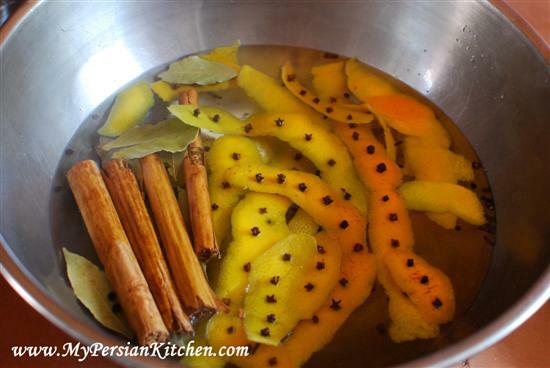 Last year I featured a turkey brine with pomegranate juice, this year we are going a different direction! A months ago I started thinking about the posts that I wanted to feature this year for Thanksgiving. 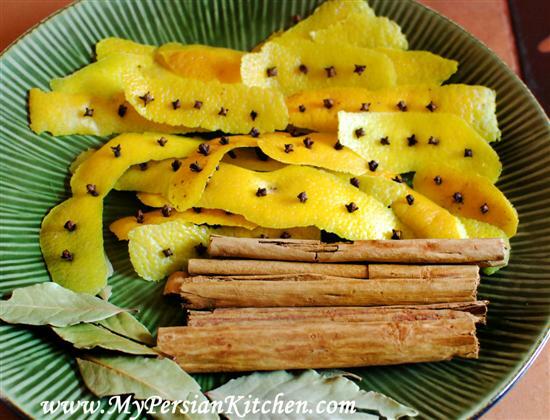 I thought about a few different combination of flavors and the one that stuck with me was inspired by one of my favorite Persian rice dishes made with orange rind and almonds. What really got my creative juices flowing was the combination of Orange and Cinnamon… and that’s how this year’s turkey theme began! First things first, make sure that your turkey is completely thawed. 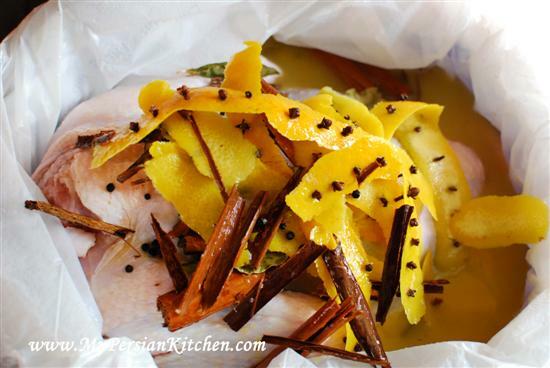 Prepare brine the day before Thanksgiving, as the turkey needs to soak for at least 12 hours. Bring 2 quarts of water to a boil. In a large bowl place sugar, salt and pepper corns. With a vegetable peeler remove skin from oranges. Pierce cloves through the orange rinds. 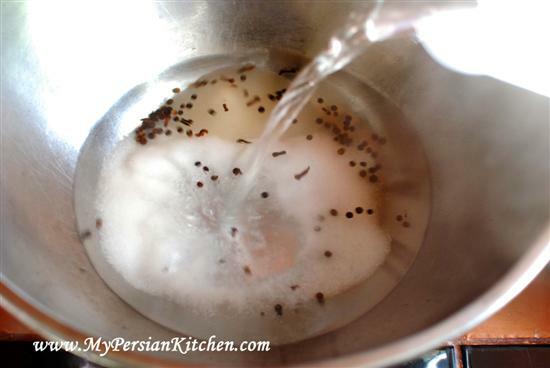 Pour boiling water in the bowl and mix well until sugar and salt have dissolved. 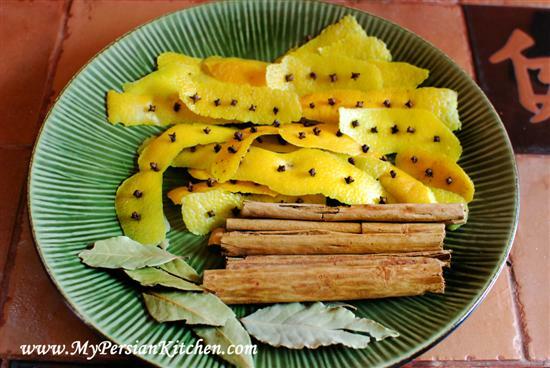 Add orange peel, cinnamon, and bay leaves to hot water and allow to brew together for a couple of hours. Once the liquid has come to room temperature add orange juice and mix well. 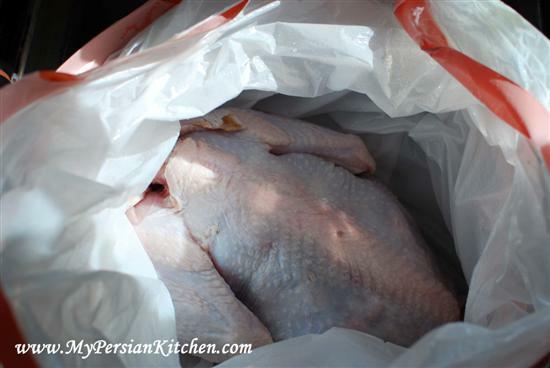 Remove turkey from packaging, remove neck and giblets from the cavity and rinse turkey. Save neck and giblets for stock making. 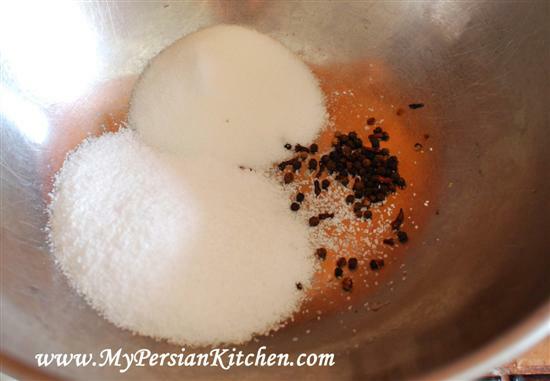 Place turkey breast down in a large bowl lined wit two large bags. 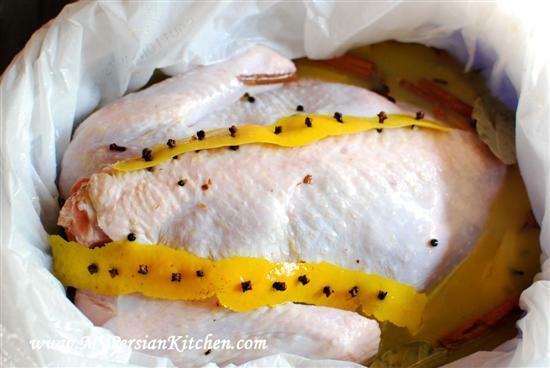 Distribute the aromatics all around the bird. Close the bags and place turkey in the fridge. Pretty easy, right? This is going to add tones of flavor to your bird!! 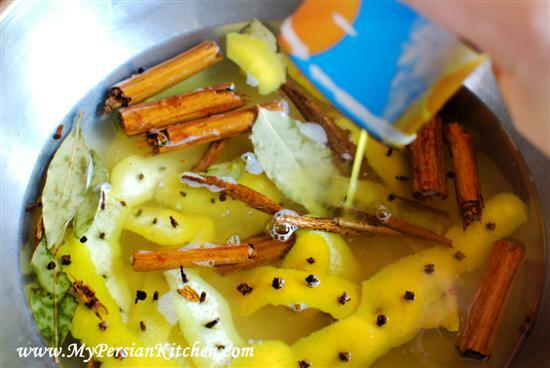 You can use this brine for regular chickens as well. All you have to do is use 1/3 of this recipe! Wow. I am so looking forward to trying that! Thank you for giving the conversion for using it with chicken! This sounds wonderful ! I’ll be trying it out with a turkey breast this year. Thanks for coming up with this recipe! As usual you are simply outstanding…I thought I was too tired to cook this holiday but you have inspired me.